The new iPhone 3G is out of the way, but technology is continually moving forwards so it is not much of a surprise that just as Apple get iPhone out the way, the rumours about new iPods has started. 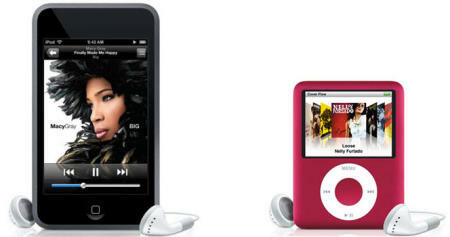 Both the iPod Nano and the iPod Touch are due for an upgrade, whilst there aren’t any firm details yet the rumours started when reference to “iPod2,1” were discovered in the code of Apple’s beta 2.1 firmware for the iPhone. What can we expect? The best change in my opinion will be a reduction in the RRPs, which will make the iPod Touch and iPod Nano a much more appealing. Other than that you can hope for a 64GB version and strangely enough Apple may even include GPS support. For the Nano, rumours suggest that is it going to get taller and thinner as well as getting a much larger screen with an iPhone/iPod Touch widescreen aspect ratio. Apple should officially announce something in September. Not that excited about the changes to the iPod Touch are nothing to get excited about but the iPod Nano with its larger screen is certainly a step in the right direction.